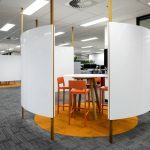 IA Design were engaged as a part of a design & construct model to deliver Regus their new co-working tenancy in Dandenong. The design is the first of its kind in Australia following a design palette of ‘Summer’. The design blends together the colours and textures of summer within the light filled space. Design features include a recessed ceiling around the breakout perimeter, feature lighting, custom joinery and feature rugs. The tenancy has a mix of artwork that has been selected for the individual offices, meeting rooms and in the corridors. The 1,270sqm tenancy incorporates flexible working zones in a large breakout area as well as support spaces and traditional office spaces. The space delivers Regus with a contemporary, vibrant and efficient co-working space that can be enjoyed by both visitors and occupants alike.